Recently, an attorney I work with told me a great story about using a simple but effective search on Navigator that helped him to reconnect with an old friend and generate new work for his firm. 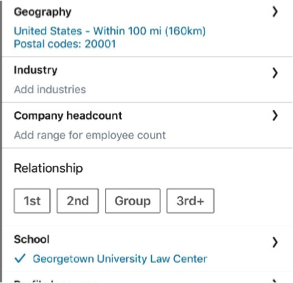 More on the specifics below, but his story got me thinking about creative, super simple searches that can boost any lawyer’s business development opportunities on LinkedIn. Why it’s so efficient: Navigator lets you save searches that run in the background while you're hard at work. Once you set up the search, you never have to create it again, and you get alerts via email whenever there are new developments. This is one of the many features that can unleash the real connective power of LinkedIn, especially for someone whose business grows because of the relationships they initiate and cultivate. With this single search, he identified a warm lead – a potential source of new business that he knew well enough to pick up the phone and call – and reconnected with his friend from law school. What could be better than that? Getting in touch with former classmates who have moved in-house is a great way to build your network of both potential clients and referral sources. Save the search; get email alerts when old friends move into your geographic area. Next, keeping tabs on the comings and goings of former colleagues is a smart way to stay ahead of potential opportunities. Set up a search so you’re among the first to congratulate a former partner when she’s named head of legal at a Fortune 500 or to rekindle your relationship with a former officemate who recently moved in-house. Remember that opportunities come from all places, including at times the ex-colleague who’s gone to a competing firm but doesn’t have a partner with your specific skills. Make a practice of connecting with all former colleagues, and you’ll be sure to have renewed a relationship with the one who ends up sending you work. Just as Navigator tells you what your clients are worried about right now, it also keeps you up to speed on important developments at the companies you work for, as well as those on your prospect list. When your clients need extra attention because they’re down one person in the legal department. When in-house departments have openings for which you can make useful recommendations. When to welcome your client’s newest lawyer to the company and bring her up to speed on the work your firm is doing. When people you’ve worked for move to new companies that you can add to your prospects list. A single search will allow you to track the movement of people at your top five clients and prospects. 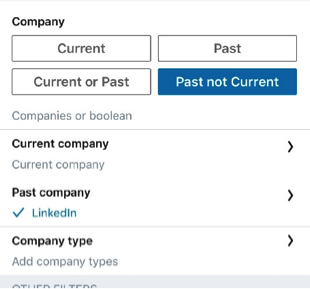 Simply add their company names to the search and select the “legal” function, as above, to uncover opportunities to connect with the people with whom you would like to work. Following personnel movements at clients you no longer work for is a great way to uncover new opportunities and rekindle old relationships. Start by setting up a search that targets a limited set of companies – no more than five – like those where you had particularly strong connections, where you helped clients navigate a rough period, or where you helped the company achieve an important milestone (or all three). Study the results for anything that might present an opening to reconnect with the people you knew well, keeping in mind that some of them may have moved to other companies (which, of course, opens another door for targeted business development activity). Whether your firm has offices throughout the state or throughout the world, you should absolutely connect with new colleagues as soon they come in the door, to initiate meaningful relationships by welcoming them to the firm, and to lay the groundwork for joint business development in the future. Saving a search in Navigator that alerts you to new hires means you won’t miss the arrival of a former GC in your Miami office or an NLRB official who joins in DC. 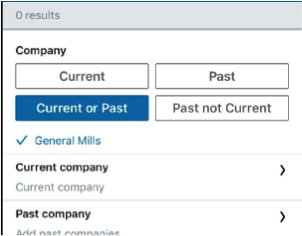 Put your firm’s name into the “company” field, and select “current” employees. Pick “legal” in the “Function” category, and “more than 10” in “Years of experience” to make sure you’re targeting the right people who join your firm. 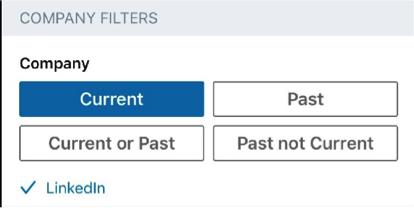 Finally, narrow your search to people with “Less than one year at current company.” It’s in the “Role and Tenure Filters” section. Set up the search, then set up a process for making them feel at home from day one by, for example, introducing yourself and offering to be a resource as they get settled, or noting contacts you have in common (which are visible in Navigator) to establish quick trust. Recently my colleague Matt Flamman asked his LinkedIn network for examples of creative searches; you can click through to see the conversation (and join it if you would like!). The takeaway: start with my five basic searches above, but know that you can also get nuanced, limited only by your imagination and hustle. I loved seeing for example how another colleague, Kayla Wills, searched on Pats fans in Boston during the Super Bowl and used that information for her advantage. Clever! What's your creative search recipe? Drop me a note and I'll collect answers into a future post.